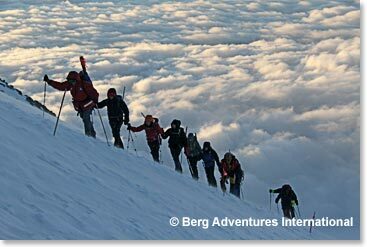 Thirteen Berg Adventures climbers are on their way to Russia where they will meet Wally Berg to attempt the summit of the highest peak in Europe: Mount Elbrus. Days spent hiking and practicing their mountaineering skills will prepare them for their summit attempt on Mount Elbrus (18,510ft/5,642m). July 19, 2016 – Looks Like We Picked the Right Summit Day! July 15, 2016 – Our Move to the Barrels!